Prince William, Kate Middleton and Prince George have all touched down in New Zealand. The trio were met from the plane by Prime Minister John Key in Wellington. 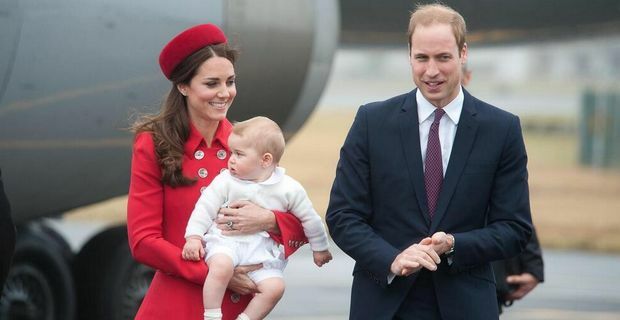 The Royals arrived to Wellington Military Terminal aboard a Royal New Zealand Air Force flight but baby George took everything about his first official duties in his stride. The Duke and Duchess of Cambridge are traveling with baby George as part of a three week visit to New Zealand and Australia. Kate looked stunning in a red outfit and also had a silver fern pinned to her coat to mark the visit. The Royals were treated to local customs including traditional Maori warriors dancing and the famous Hongi, a traditional greeting where two people press their nose and forehead gently against the person they are greeting. Mr Key wanted to set the tone for the official visit and promptly tweeted "The Royals have landed in Wellington. Let's make them very welcome, New Zealand.". Prince George looked content as his parents carried out their official duties. The public have been hungry for pictures of baby George ever since his birth last year. Kate must be chuffed with the attention, usually reserved for her, now being shifted towards George and so far the New Zealand trip has offered plenty of snaps so far to keep everybody happy at home.